IACEE's Quality Program for Continuing Education, earlier known as Continuing Professional Development Benchmarking and Quality Improvement Program (CPD-BQIP), originated as the Development of Accreditation in Engineering Education and Training (DAETE) project sponsored by IACEE. It has been developed over the past five years with IACEE support and external funding through the U.S. Department of Education and the European Union. The Program’s standard is based on the European Foundation for Quality Management (EFQM) Excellence Model, adapted for applicability to CPD and Continuing Education (CE) organizations. 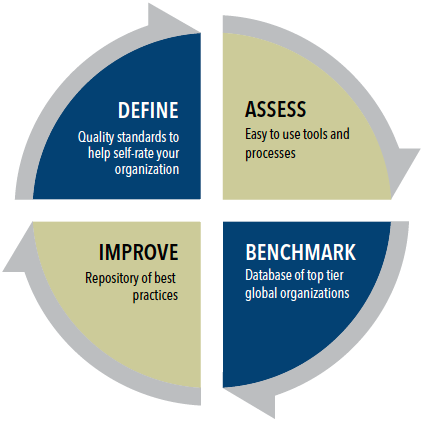 All institutional IACEE members are encouraged to register for this organizational quality improvement and benchmarking program, which is a FREE benefit of IACEE membership. As the number of users increases and the size of the database increases, the quality of the benchmarking data will improve and be of greater value to all of us! Please register here. The IACEE has shown itself to be at the forefront in continuing professional development by establishing CPD-BQIP as the first ever international standard for managing quality in CPD programs at the organizational level. IACEE is making this program available to CPD and CE organizations from all disciplines. Data collection and reporting within CPD-BQIP have been automated via a web-based platform to enable better and more scalable access to the self-assessment and benchmarking tools.